The Northeast is a very different part in India. Not because of its natural beauty, or the way its people look or dress. It’s how they behave and what they practice. I experience this difference everyday right here in Bangalore. I employ two girls who work for a few hours at my home. One of them, Salina, a Buddhist, is 22, born and raised by a tea-picker in the hills of Darjeeling, and now married to a chef at a nearby ‘Chinese’ restaurant. The other, Chandra, a Hindu, 25 years old, is from a village near Chennai, urbanized by Bangalore, divorced her first husband because he had an extra-marital relationship. I feel blessed to have found them so my toddler does not feel he is in a house with two old and low-energy adults, rather he gets to challenge their youthful energy and chatter away in multiple languages. While Chandra is aggressive, hardworking and religious, Salina is peaceful, soft-spoken and my daily reminder of Zen in everyday life as though the hills are always inside her. For the past two years, in the hope of a second marriage, Chandra has saved money and taken a holiday every Akshaya Trithiya to buy gold for her dowry. Salina, on the other hand, followed a very different path to marriage, one that’s quite common in her community. This chef liked her and proposed. Once she accepted, he took her away to Bangalore after making a promise of marriage to the parents. They returned home for Dussehra to get married in two exclusive ceremonies – one at the girl’s side where only the girls’ side attends, the other at the boys’ side. Neither parents are expected to attend the other side’s wedding celebration so one is free to conduct it as per one’s financial capacity. The village will pitch in to help in the arrangements. There is no dowry or gifting to the other side. Given the stark contrast of the two cultures, we’ve discussed this topic several times at my home, and Salina has in the past innocently questioned me why Chandra’s family needs to give something when they’re already giving up the daughter? Today when Chandra’s gold requirement was discussed again, Salina turned to me and said – Didi, jiski ek bhi beti hogi, usse bhi dena padega, phir woh bete ke liye kyu leta hai? (Anyone with a daughter knows he has to give, so why does he take for his son?) I had no answer except that this is a major reason families don’t want to have a girl. Not happy with that answer, she probed further – What about you people (as if she is refering to an elite class)? Do you follow any such inequality in weddings too? (paraphrasing in English). I was dumbstruck for a second. What should I say? I was lucky enough to get married into a family that wholeheartedly supported an equally-shared wedding. Although both sides were well off, we strictly followed the no-gifts rule, divided the entire expense by three, my husband and I wanting to invest one-third too since we were both earning adults who had just returned from the US. A love marriage with the 1/3rd idea remains an unusual wedding in my family till this day, but that’s all a matter of perspective. I don’t get any points with Salina. She comes from a land where an equal wedding is the norm. Besides, I study Buddhism and often discuss the meaning of some chants with her. I did not want to confess that her Buddha-loving employer has also been part of weddings where the girl’s side had to take an unequal share of the expense. What came out of my mouth was not what I know in my heart. I told her that some forms of inequality continue but they are not strictly followed by educated people. I dont want her to lose faith in education. I have been coaxing her to brush up on the little education she had (standard 4), and thanks to my son she now flawlessly sings every nursery rhyme known to him. If I tell her that education or speaking fluent (or even NRI accented) English has not made much difference, she may lose respect for everything she aspires to be. How do I tell her that even in “my people”, the girls’ side is still traditionally supposed to fund the wedding expense, and dowry although abolished is sometimes morphed into expensive gifts and rituals. The problem is severe in the lower-income communities and that’s where the hurt and burden is felt the most. However it wouldn’t hurt to have the educated class set an example each time they get a chance. Education must show a promise of fairness to the uneducated. Only then will a poor man aspire to creating an educated family and not a can-afford-dowry family. Unfortunately, Chandra’s parents have given up on her. They expect her to fund her next dowry since she did not adjust to an unfaithful husband. I see her save up every penny and wait for the days when gold prices fall. Despite Chandra’s grit and hard work, Chandra’s mother is resentful about her situation, while Salina’s mother is joyful and can’t wait for her daughter’s phone calls. Eventually, life’s happiness boils down to the love you are given by your family. A woman tea-picker in the hills of Darjeeling earning Rs. 10 per hour feels rich and looks beautiful not because of the Himalayas that surround her, but because her heart has never been told to feel any ‘less’. 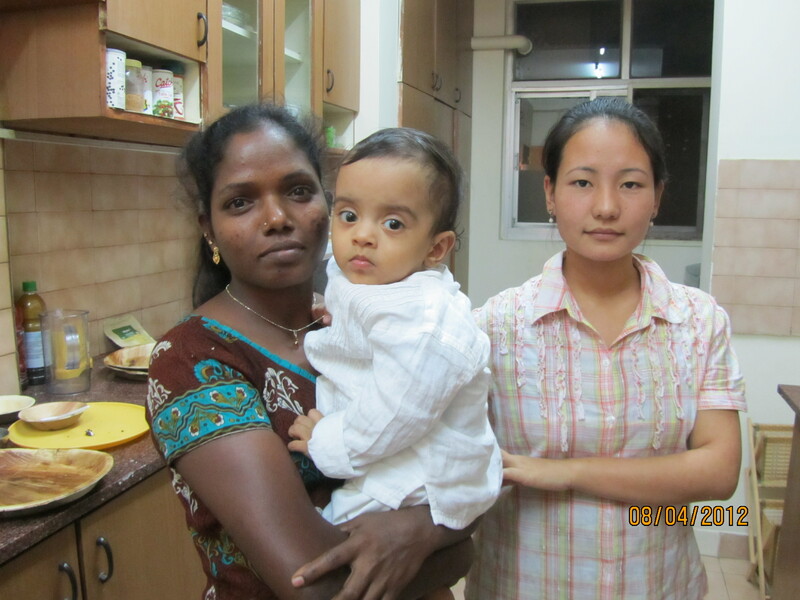 A picture of Chandra and Salina with my son when he was nine months old. PS: My father had composed a very apt and beautiful poem in Hindi about life after marriage for a working couple in urban India. The entire poem is full of all the drama and various issues that come up, but the four lines below are what he wrote to describe the importance of maids (bai) in our lives. बाईयों का मेरे जीवन मे विशेष स्थान है. उनकी हालत सत्तर (70) साल के स्वराज का टुटा भरोसा हेै. The dowry discussion in my home was a reminder yet again that we’re still far away from dropping the baggage of the past and realizing the dream of independence. eye opening blog if educated class takes the troble of opening the eyes!